Raise your hand if you like eating rice! 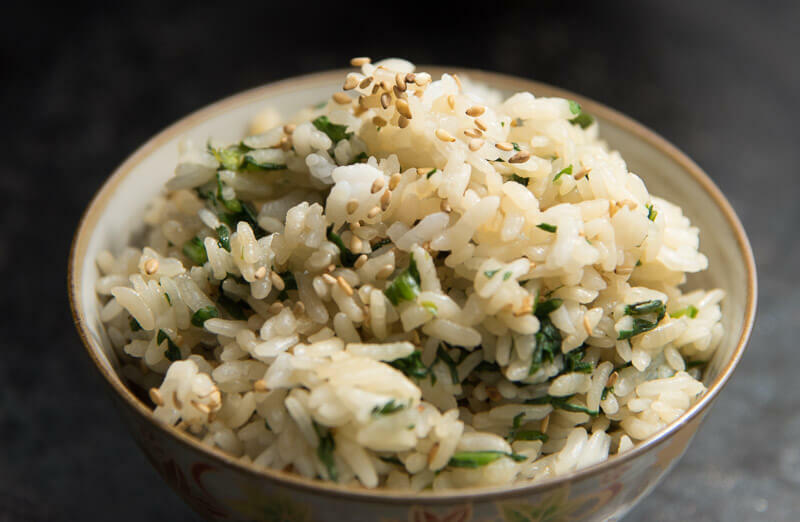 Shungiku Mazegohan is a delicious and simple way to enhance your rice eating experience. You ready?! You might have begun your flavorful rice journey with baby steps. 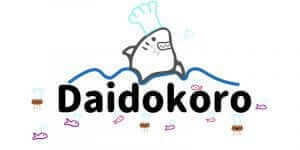 You know like, adding tsukudani, furikake or even umeboshi. But eventually, if you eat enough Japanese food you’ll come across takikomigohan and mazegohan. Takikomigohan (‘rice cooked together) is where you cook ingredients with rice and mazegohan (mixed rice) is where you cook separately and then mix. 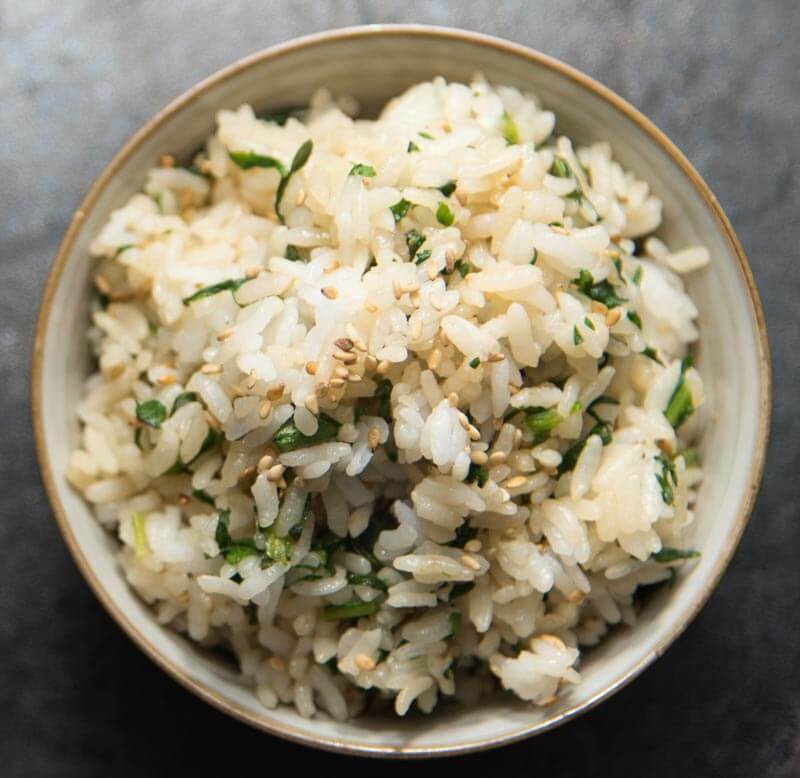 This mazegohan recipe will work magic on your taste buds thanks to the subtle aromatics and background nuttiness of sesame seeds. I remember the first time I bit into shungiku leaves. I had them in sukiyaki and they go perfectly with that sweet and salty broth. After that I tried experimenting more with this magical ingredient. I actually didn’t like the shungiku prepared as goma-ae because it was too strong, at least for me. I couldn’t handle the flavor. But for you shungiku lovers out there, maybe it’s one of your favorites! As for me, I continued to look for ways to incorporate this humble little green. And one of my favorite recipes is this mazegohan or mixed rice. This recipe uses that magic little device (called the microwave) to cook the greens. The purpose is to soften the greens and also release some of the aromatics. Chop the leaves and stems coarsely because IMO it tastes better! You’ll also be microwaving your mirin to get the alcohol out, but preserve the sweet umami flavors it’s known to add. While this recipe calls for light soy sauce (usukuchishoyu) if you don’t have it, just use regular soy sauce. Usukuchishoyu generally has a lighter color and flavor, but higher salt content. So it’s good to use if you want to try to preserve the colors or flavors of your ingredients. I did experiement with ground sesame seeds and felt it was a little too strong for my tastes and seemed to overpower the shungiku. I’d recommend leaving them whole unless you prefer a dominant sesame flavor. No sesame seeds? Substitute with a teaspoon of sesame oil. No sesame oil either?! Poo. poo. poo!! May be better to wait until you have at least the seeds or the oil. It really makes the dish!! Last week I shared an umeboshi takikomigohan recipe, so here’s an alternative to that – mazegohan. A good alternative if you don’t like umeboshi! 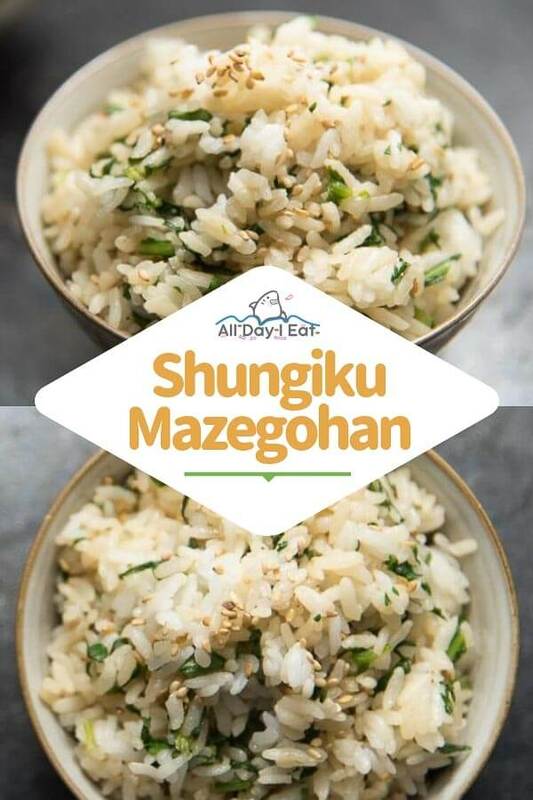 Here’s a short video that shows you how to make Shungiku Mazegohan! Have you made mazegohan before? If so, what do you like to put in it?! Raise your hand if you like eating rice! 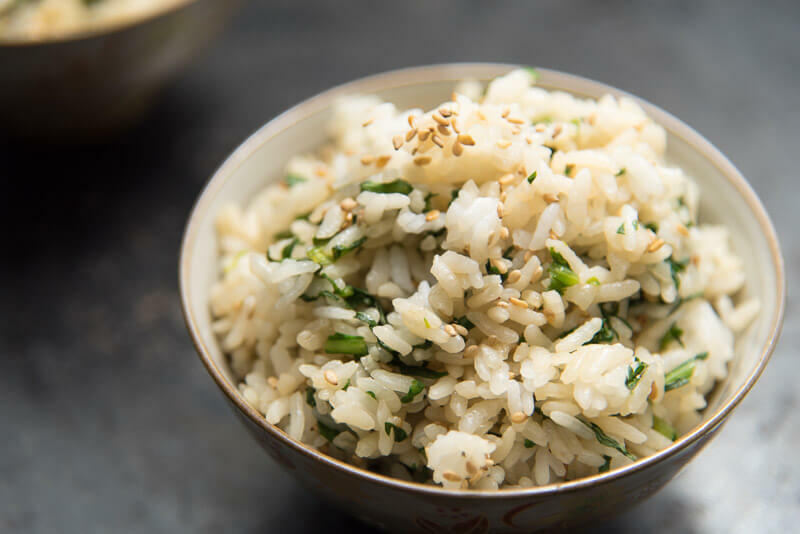 Shungiku Mazegohan is a delicious and simple way to enhance your rice eating experience. 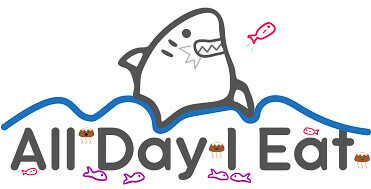 You ready?! You might have begun your flavorful rice journey with baby steps. You know like, adding tsukudani, furikake or even umeboshi. But eventually, if you eat enough Japanese food you'll come across takikomigohan and mazegohan. Takikomigohan ('rice cooked together) is where you cook ingredients with rice and mazegohan (mixed rice) is where you cook separately and then mix. This mazegohan recipe will work magic on your taste buds thanks to the subtle aromatics and background nuttiness of sesame seeds. 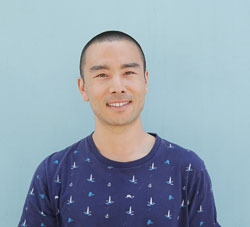 Wash shungiku and separate small branches from the thick main branch. (Discard the main branch.) Cut branches and leaves into ½ inch pieces and place in a large microwave safe bowl. Microwave the shungiku for about 1 minute 30 seconds to soften. Next microwave 1 Tbsp mirin for about 10 seconds (to get the alcohol off). It should be steaming, if not, microwave a few seconds more. Now we will mix everything together. Add the rice to the bowl with the shungiku and add mirin, usukuchi shoyu, and sesame seeds. Reserve some to top if desired.